SAFF women football: Nepal enters final - Integration Through Media ....! 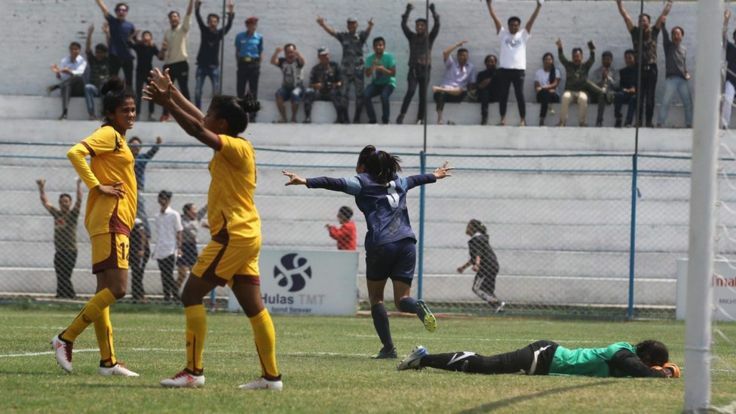 BIRATNAGAR: Nepal secured its place in the final of the fifth SAFF Women Football by winning the today’s first semifinal match against Sri Lanka, 4-0. In the match held at the Martyrs’ Stadium, Punam Jarghamagar, Anita Basnet, Sabitra Bhandari and Rekha Poudel scored a goal each for the team. The team made its first score in the 42nd minute and it came from Jarghamagar. In the 73rd minute, Basnet hit the goalpost, leading the team by 2-0 and in the 82nd minute, Bhandari netted the ball through a header and in the 86th minute, Poudel scored the fourth goal for the team. She replaced team captain Niru Thapa in the 64th minute of the match. Nepal played aggressive since the beginning. It is facing either India or Bangladesh for the final on coming Friday.